The Ohio Department of Health says a 73-year-old Hancock County woman is the first state resident to contract salmonella from pre-cut melons. 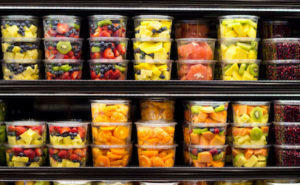 Federal health officials say a salmonella outbreak linked to pre-cut melon has sickened 60 people in Ohio and four other Midwestern states. A new study by the progressive-leaning think tank Policy Matters Ohio shows one in ten Amazon employees or family members in the state received food stamp benefits in August of last year.